I know a lot has been going on inside, but this is the first major change outside the new grocery store. I can't tell you how excited I'll be when the day comes that I"m making dinner, it's 6:00, everything's moving along, and I realize I don't have an onion. Or a lemon. Or i'm out of sugar. Or whatever..and I can just run out and grab it and be back before the water boils. But I have been troubled by some comments I'm hearing around town. The new owners are Korean, and for some reason people are fixating on this and making a lot of assumptions about what kind of market it will be. "It's a Korean Deli." "..competition from that new Korean grocery..." - I'm genuinely (perhaps naively) surprised by the focus on ethnicity. We don't live in the most diverse spot on earth, heaven knows - the first time my daughter noticed a man with dark skin and made a comment about it, she was all of three, and we were nowhere near here. But still, I'd hope people would pay attention to what he's doing, not where he was born. I suppose in NYC "Korean deli" isn't pejorative - it's just a fact that there is a network of small corner groceries, owned by Koreans, that carry a certain fairly predictable line of items (or at least that was true when I lived there, over a decade ago.) The produce was always fresh, the tofu was great, and I loved the fig bars! But in the comments I've heard, I'm not so sure that appellation was used in such a neutral way - I felt I was hearing a tinge of anxiety from people about a stranger, an outsider coming in. Maybe that would be the case no matter who it was - he's from Long Island and it could just as well have been a Jewish grocer, or an Italian one - would the same people say "Jewish deli" (I know I would - bring on the pastrami!) or "Italian market?" Why, to my ears, do either of those feel less pejorative than what I have been hearing? It's a puzzlement. Any thoughts? Many. The first being, Lee and Alex are doing the deli and bakery, the owners of JAM, which is currently across the street on Calkinstown. They may be a lot of things but Korean is not one. Having just returned from Korea, I heard the word 'Korean' thrown around a lot -- mostly by Koreans themselves. I wouldn't read too much into it. 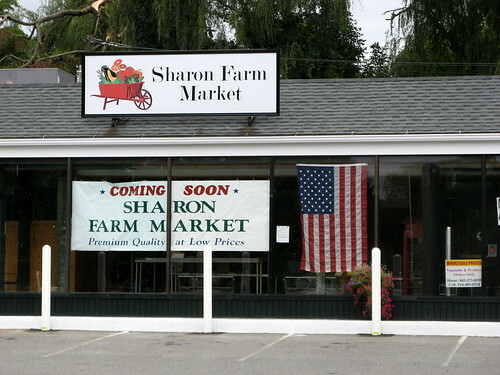 I think the assumption, given the Korean markets in NYC, that the Sharon establishment would have a Korean flavor, are understandable and not a cause for concern. My daughter is married to a Chinese and they have 2 daughters. On a visit from Hartford they heard about the asian ties to the market and were very exited. Now when they visit me they will enjoy more of an international Brigadoon!